Punaluu Beach Park offers the grassiest sites, best facilities and best ocean views. The fourth edition of Andrew Doughty's "The Big Island Revealed" in hand, I've just completed an inspection of all of Hawaii County's beach camping facilities for Star-Bulletin families considering a tent outing this summer. Just short of 225 road miles, starting in Kailua-Kona and going counterclockwise, with tents, extra-wide blow-up mattresses for comfort, a propane stove and -- important, as you'll see later -- a 7-gallon container for drinking and cooking water. "Camping on the island of Hawaii probably should be done as a last resort, or as an option only if everything checks out when you get here and ask around. 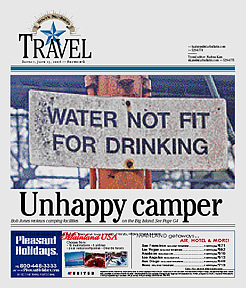 Some places, like Whittington Beach, Milolii, and Spencer Beach are especially noted for camper-unfriendly incidents." I found no camper unfriendliness at all. No stink-eye. Just dilapidated facilities, lack of security and lots of drinking at night. The mayor and Council obviously aren't spending much on the parks, and that's a shame. Mainlanders used to so much better will be shocked. 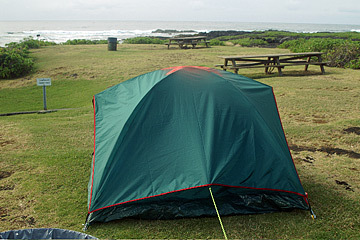 Spencer Beach Park is the only Big Island camping park with on-site, 24-hour security. Maybe that's the plan? Make them pay for hotel rooms? Hawaii County lets you book campsites online (www.hawaiicounty.com/parks/parks.htm) and send permits instantly by e-mail. Cheerful help via phone can be obtained at 808-961-8311. State Parks? There's no online booking, and calls to phone numbers listed at the state Web site weren't answered. One that did have a recording said that "due to budget restrictions, phone calls from outside Hawaii will not be returned." I drove to the Kalanimoku Building permit office in Honolulu and waited my turn, only to have a sour, non-phone-answering woman clerk tell me the park I wanted to visit was closed. 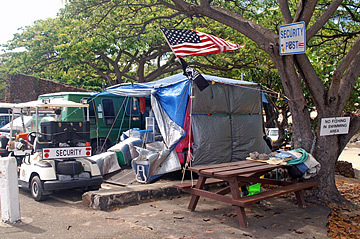 The disgraceful condition of the bathroom at the south tenting area of Laupahoehoe Beach Park discourages some campers. Hookena Beach Park: Scruffy at first glance, but a great swimming beach needed closer scrutiny. Cold and solar showers are available, but there's no drinking water or electricity. Bathrooms are OK, and a covered pavilion offers some protection from the sun. Tent sites are on the sand. No supplies or gas is available nearby, so everything you need must be brought in. 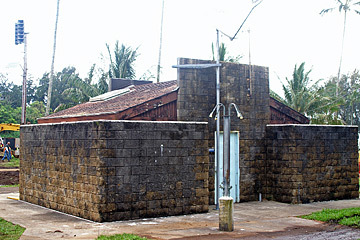 Milolii Beach Park: Hawaii's last fishing village has no drinking water, no showers or electricity, but toilets are clean and there's a covered pavilion. Only three good tenting sites are available, and there's a safe, shallow lagoon for kids. Locals consider this their park on weekends. There's a small sundry store nearby but no gas. Whittington Beach Park: Oddly, no turnoff marks this site on Highway 11 between the 61 and 62 mile marker north of Naalehu. It used to be spooky but is now respectably covered with manicured grass. There are outdoor cold shower facilities but no drinking water. This nonswimming beach park tends to draw some homeless. Supplies, gas and restaurants are nearby in Naalehu. Punaluu Beach Park: Fantastic. Grassy. Well-maintained facilities include electrical outlets, clean bathrooms, covered pavilions, drinking water and a lighted parking lot. The downside is that it's overrun by feral cats and mongooses feeding out of open, 30-gallon garbage barrels with no covers. The black-sand beach is not safe for children or bad swimmers. Supplies, gas and a restaurant nearby in Pahala. Arnott's Lodge: This private, touristy property in Keaukaha allows you to pitch tents on the lawn for $10 per night, including use of great bathrooms, showers, laundry and patio-dining facilities. It's like camping in a back yard but gives you access to shoreline swimming parks and downtown Hilo, and a break from camp cooking to eat at the Hilo Bay Cafe, Kuhio Cafe, Nori's or Cafe Pesto. Kolekole Beach Park: The gorgeousness of this park's setting 15 miles north of Hilo, with a bridge and waterfall, is marred by a horrible tent pavilion that should be demolished. There are electrical outlets and cold showers but no drinking water -- or, as this island's signs always put it: "Water Not Fit For Drinking." This nonswimming beach is best avoided on weekends, when the drinking and noise can get out of hand. If you get rained or bummed out, seek shelter at Akiko's Buddhist Bed & Breakfast establishment 200 yards north on the old belt road in Wailea. No supplies or gas are available in the vicinity. Laupahoehoe Point Park: The most stunning of all the park settings, this park is currently torn up by septic tank work, and the restroom in the best (south) tenting area is filthy. Neglected pavilions are rotting. Drinking water, electricity and cold shower facilities are available. There's swimming access at the boat ramp when the water's fairly flat. Adults and kids will love breakfast, lunch or dinner at the amazing Back to the '50s Cafe in mauka Laupahoehoe town. Use this camp as a base for visiting antique shops in Honokaa or exploring the many former sugar towns nearby. Supplies are available at Sakoda Store. Kalopa Park: The state's up-forest park is closed for repairs (and it rains a lot there), but the Hotel Honoka'a Club in the center of town has everything from hostel space for $18 to ocean-view rooms at $68. It's also $68 for standard rooms at the Kamuela Inn in the heart of Waimea. While in the area, visit the Waipio lookout and valley beach (too dangerous for swimming), ride horses at Dahana Ranch (www.konahorseback.com) and don't miss going on a two-hour ATV ride at spectacular Kahua Ranch (www.kahuaranch.com). Keokea Beach Park: East of Kapaau in North Kohala, this park has been closed to camping because of several no-permit violations (read: homeless and drifters), but it provides a gorgeous setting for your takeout or made-on-the-spot lunch, with nice restrooms, a pavilion, oceanfront gazebo and tables on the grass. Mahukona Beach Park: This is an old train terminal where sugar was unloaded from Kohala Mill for shipping. The harbor and pier provided excellent snorkeling access until someone removed the pier-side ladder. Boo! Very marginal bathrooms and a cold outdoor shower. No drinking water. Hawi youth bands frequently use the covered pavilion to practice loud and lousy music. No supply or gas outlets are in the vicinity. Spencer Beach Park: The only full-service park offers drinking water, electricity, nice restrooms, showers, a great swimming beach, lifeguard and 24-hour security provided by a 1st Air Cavalry veteran of Vietnam. But wind gusts can send tents out to sea. You must do serious staking here. It's very crowded on weekends. Supplies, gas and restaurants are at nearby Kawaihae. ALL PARK RESTROOMS had full rolls of toilet paper. My main complaint is that the camping parks, unlike mainland parks, don't have entry-point controls or security, except for Spencer, to handle loiterers, drinking and noise. Also, even with your permit, tent space is strictly first come, first served. There are no site assignments, which doesn't make sense. Mayor Harry Kim needs to look at how ratty most of the parks have become. For a state that depends on tourism, these are eyesores. Gov. Linda Lingle also needs to consider restructuring that dysfunctional Kalanimoku Building state permit office. Why can't we have parks and park services just as wonderful as those of Washington, Oregon and California? Maybe the people running our parks need to hear from more unhappy campers.